It was a clear day as we flew into New York City airspace to begin our four-day excursion in the Big Apple. Gargantuan mansions started to give way to neighborhoods which gave way to burroughs which served up the landing strip of LaGuardia Airport-named for the transformational Mayor of this great city who served from 1934 to 1945, also its first Italian-American chief executive. We went from flying over water (Flushing Bay) to touching down on a strip built out over top of the water in an instant, a hard landing that welcomed us to the city that has welcomed billions over the past four centuries (almost)since it was founded in 1624 by the Dutch. LaGuardia is an old-school airport, with a terminal building that smacks of a bygone era-unfamiliar narrow walkways, tiny kiosks and architecture that has a distinct 1960s feel. In its day, it was considered the greatest airport in the world. Now, it feels like a museum waiting to happen. 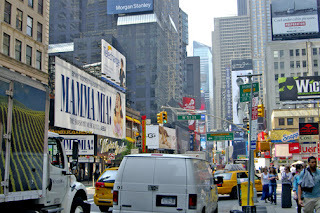 The taxi ride into Manhattan thrust us into some of the most incredible traffic that I've seen, multiple steams of buses, cars, trucks and cabs trying to merge into one or two lanes, the rush to downtown unceasing. 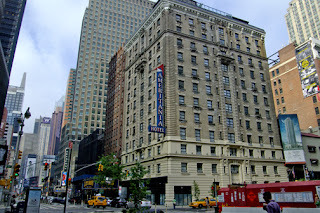 We arrived safe and sound at our hotel-the Ameritania, directly adjacent to the Ed Sullivan Theater and the home of Late Night with David Letterman-just ahead of Claude and Tiffany who were on the way from a hotel uptown that they had stayed at the night previous. Checking our bags, as our rooms were not quite ready yet, we strolled up Broadway and into what felt like the centre of the universe-Times Square. Surrounded by giant digital billboards,remarkable in their luminosity and design, and scores of people moving about in mutual adulation of one of the world's most incredible spots. The energy, excitement, and anticipation were omnipresent as we made our was to a restaurant just a block off the Great White Way for lunch. 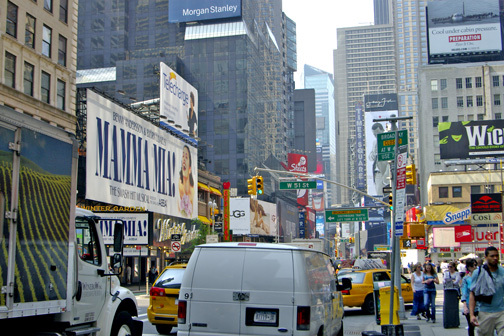 The Theater District is overflowing with advertisements, some several stories tall and a block long, trying to draw attention to the latest and greatest Broadway hits: Wicked, The Lion King, Chicago, Billy Elliot, The Addams Family, Rock of Ages, Jersey Boys and War Horse. Young ladies dressed as flight attendants stood on the corner trying to create a buzz for Catch Me If You Can, the new musical based on the film that starred Leonardo DiCaprio. 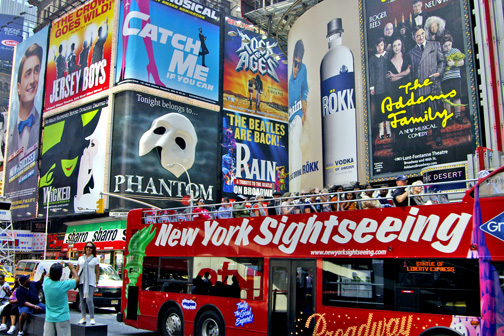 We will be going to see a couple of shows today, which ones will be determined by the deals we can get at TKTS, a discount ticket service that sits facing the giant ball suspended at the tip of Times Square. Following a short nap - by the this time I had had maybe three hours sleep over the past two days - we grabbed the A-train and made our way to the financial district to catch the Zeypher, a hour-long boat tour of East River and the Hudson. The older gentlemen who provided the narration on the trip, gave us a quick glimpse into the history of the city and its many iconic pieces like lower Manhattan, Battery Park, Governor's Island, Brooklyn (The City of Churches), the Statue of Liberty, Ellis Island and the three bridges that traverse the East River (BMW - Brooklyn, Manhattan and the Williamsburg). It was a great way to see the city from the water, with the cooling breeze whipping across our faces, and the sun partially blocked out by broken cloud and menacing smog. We walked from the boat terminal, up Wall Street through the Financial District with its towering buildings, hoards of smartly-dressed young titans of industry, and the New York Stock Exchange. As we walked by the long fence that parcels off ground-zero, the site of the former World Trade Center towers, Claude made a bee-line for Century 21, a clothing store that feeds the fashion frenzy of the business class, not only of NYC, but of the world. The prices, the selection, the amount of customers was unlike anything I have experienced - the exception perhaps being at Walmart on the last shopping day before Christmas. 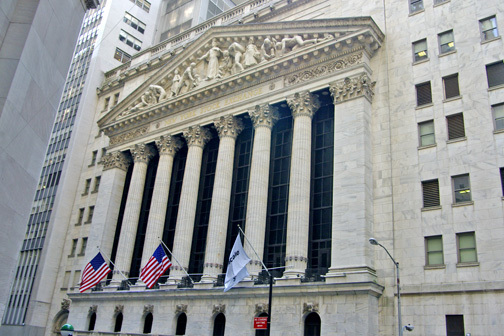 "To do this right, you have to come in here with a strategy," I said to Claude, over-simulated beyond belief with an endless selection of ties, pants, suits and sport coats. I ended up buying a couple of ties and a jacket before escaping the madness to the safety of the sidewalk and the great outdoors. 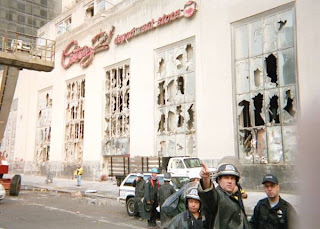 Standing out there, waiting for the others to wrap up their purchases, I imagined what that spot must have been like on September 11, 2001 as those buildings collapsed to the ground just a couple of hundred feet away. Did the pile of rubble reach this spot? I thought to myself. Would I have survived standing here? For dinner we went to Keens, a restaurant and pub that has been around for the better part of 125 years. 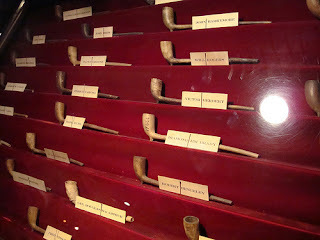 Clay pipes line the ceiling, with signed pipes from celebrities, politicians and power brokers who have enjoyed its mutton chops and sumptuous steaks over the years, behind glass display cabinets. The names are a who's who of the past century: John F. Kennedy, Liza Minnelli, Tom Hanks, Teddy Roosevelt and Wild Bill Cody, to name but a small few. 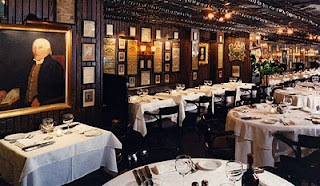 The food was plentiful and wonderful, the company delightful, and the atmosphere jovial and quixotic. Unbelievable carrot cake for dessert at Juniors and we were ready to head back to the hotel and fall into a satisfied sleep. We are in the centre of the universe, and it feels wonderful.